December | 2009 | Wait... What? I come up against a nagging question when I’m thinking about mapping, when I’m talking about the projects I’m involved in, or when I’m working directly with staff and youth in rural communities using participatory mapping methodologies…. better than this kind of map? Well… is it actually better? And if it is better, when is it better, for whom and why? I understand how useful mapping information is for big picture decision making, trend spotting and knowledge sharing at different levels. Mapping in various forms is incredibly useful for program and advocacy work, and there are many examples of how crowd sourcing, digital mapping, and information geo-visualization can be done successfully (mapping stockouts, elections monitoring, human rights incident reporting, crisis management, public health). The potential is huge and exciting. But when I’m sitting around with a group of people in a rural community without many services, it can be pretty hard to remember or to explain the benefits of digital mapping over low tech map making. Why should people make a digital map if they only have sporadic electricity and internet access (if at all) and not many smart phones. How will they access that digital map on a regular basis once they make it? Does the fact that they could make a digital map, necessarily mean that they should? I guess my key concern is around how digital mapping is directly useful for the folks who are inputting the information, building the map. The “what’s in it for them” question. As I was pondering this nagging question, @NiJeL_mapping posted something on Twitter that caught my eye and helped spur along the idea of working through these thoughts. He was at the Mobile Data for Social Action in the MidEast conference, hosted by UNICEF Innovations and MobileActive. He tweeted: “what data are we going to collect, how will we collect it, and from whom?” Then he tweeted: “Again, the push for technology w/o any knowledge of the intended outcome is frustrating” And a last tweet “overhearing whispers about how we need to focus on the technology, but impossible w/o knowing info to collect”. This really reminded me that you need to have clear objectives and reasons for collecting data before you decide what cool new technology will be used to do it. A few days ago I read JD’s blog post giving an overview of the whole conference. The key point for me was that the ‘target’ population delegation “felt overwhelmed by the host of tools and projects presented to them and were unsure how any of this could benefit them”. Luckily, he said, the conference organizers realized this and quickly altered the course of the event. Well, if you have ever asked yourself a question, it’s pretty likely that someone else has asked it too, and you can find some answers online. So I went digging around for thoughts from 4 initiatives that I’ve been following over the past year or so: Ushahidi, MapKibera, Wikimapa, and now NiJeL too. In very quick summary, Ushahidi is often (but not exclusively) used as a crisis mapping tool for rapid crowd sourced information, decision making, and trend analysis. 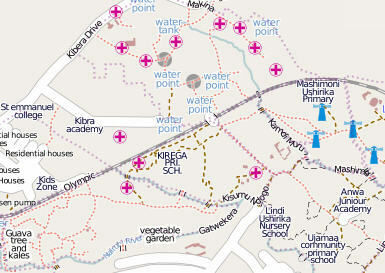 Map Kibera and Wikimapa both use mapping and user-generated media for social inclusion, community voice, community media and community planning. NiJeL works with participatory mapping, bringing it to the web for a variety of geo-visualization uses such as planning, resource allocation, impact visualization and advocacy. The objectives of Map Kibera seem similar to those of the YETAM project, the initiative that has taken up most of my work hours over the past couple years. YETAM’s main goals are engaging youth in the local development process and helping them develop the skills and tools to communicate and advocate for their rights and their ideas with local, national and global audiences. 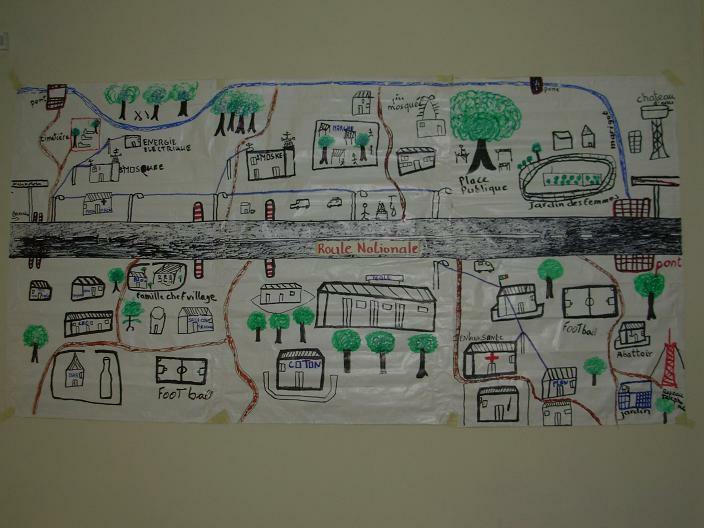 The project starts off with map making to visualize community profile, community history, community resources, and risks to child rights and protection. Group discussions ensue, issues are prioritized by the youth, and they then create art and media around those issues. The arts and media materials that youth produce throughout the project are shared with community members, district officials and national authorities to generate dialogue. They’re also plotted onto a digital version of their map and uploaded to the web for the global audience. Since the local audience is the main one for the media and arts that youth produce during YETAM project activities, followed by district, national and global audiences, it would seem then that the same is true for the map. It must first speak to the local audience, to the community. It should be first useful to users and producers of the information, as a learning/discussion tool and as a decision making tool, and secondly be useful to a national and then a global audience. Perhaps this will be the case for many of the initiatives that Plan supports and facilitates, given Plan’s child-centered community develop approach and the fact that we use participatory mapping methodologies in our community work all the time. So we need to find a way for the hand-drawn map to be transformed into a digital map (this is what we’ve been doing up to now in the YETAM project), or find a way to make a digital map attractive and useful to local people. Or we could also keep doing both the low-tech and the digital versions. The Wikimapa Brazil project (paraphrasing from their website) aims to promote social inclusion using virtual and mobile mapping in low-income areas and slums, since available mapping services have not offered information from these marginalized areas. The project aims to democratize access to information and raise low-income youth’s social participation from simple consumers of information to providers of information and change agents promoting local development and broadening perspectives and creating new cultural and geographical reference points. In this case, the project goals are similar to YETAM and Map Kibera, but the project is primarily aimed at reducing marginalization and exclusion within available mapping services. Therefore it seems relevant that on-line mapping is chosen as the mapping methodology. It may also be the case that residents in the project area have easy access to internet, meaning they would be able to continually use and benefit from the on-line maps. Patrick Meier from Ushahidi and the Harvard Humanitarian Institute talks specifically about the concepts of participatory mapping, social mapping and crowd feeding during this 30 min video. He comments that the information that’s collected via “crowd sourcing” needs to go right back to ‘the crowd’ who provided it (crowd feeding). One way that Ushahidi is doing this in communities that do not have regular access to internet is by allowing people to subscribe to SMS alerts when a crisis event hits a particular area where they have a special interest. Another way to ensure that map makers have information returned to them, he says, is to use transparencies in a manual approach to GIS where information is made more compelling by laying thematic transparent layers over a base map to show dynamic changes and trends. Patrick points to Tactical Technology Collective’s Maps for Advocacy booklet which documents a number of different mapping techniques and mapping projects and how they have been used for advocacy. So, I would conclude that in the case of Ushahidi and crisis mapping to see trends in time and space, to have immediate and up to date information, and to manage a broad set of information for crisis decision making, it also is logical that an online map is the primary mapping methodology. In this case, the information is crowd sourced, so it comes from many, and it’s processed and aggregated on Ushahidi to go back to many. Because the information in a crisis situation is changing rapidly, it would be difficult to use a static map, a hand drawn map or one that is updated less frequently. In the case of Plan, as part of the Violence Against Children (VAC) project we are planning to pilot incident reporting by SMS of violence against children and subsequent mapping of the situation in order to raise awareness among families and community members, and to advocate to local, national and global authorities to uphold their responsibilities and promises in this aspect. The question here will be how to make both crowd sourcing and crowd feeding something that is easily accessible by the participating youth and communities as well as to the other audiences in order to have the desired impact and reach the desired outcomes. The participating youth have already been trained on violence against children (VAC), its causes and effects, and ways to advocate around it. Now the key will be training them on the technology so that they can discover and design ways to use it to meet their goals. A key point will be evaluating whether the outcome is a reduction in VAC. So in conclusion I would have to say that one map is not better than the other map. They are both amazing tools and need to be selected depending on the situation. There is no one size fits all. It goes back to the point of having defined objectives and outcomes for the initiative, knowing what information will be collected, why, with whom, by whom, and for whom first, analyzing the local context as part of that process, knowing about what tools exist and finding the right tool/technology/information management process for the goals that people want to reach based on the context. It’s also about keeping the end-user in mind, and ensuring that those who are producing information have access to that information. I think I will have to keep my question in mind at all times, actually. The FLAP Bag is a project that was initiated at PopTech, together with Portable Light and Timbuk2 (join the discussion on FLAP bags here) The FLAP is a messenger bag, designed by Timbuk2, which incorporates a removable flexible solar panel made by Portable Light. 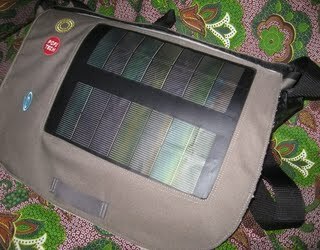 The solar panel can be left on the bag and charged on the go (i.e. while you walk around in the sun) or removed and laid out flat to absorb the sun. Connected to the solar panel is a battery that feeds into a small light, useful for walking/riding a bike at night, and a mobile phone charger. Photo: FLAP bag. For use at home when there is no power, the light can be hung up or set up to reflect off the silvery back side of the solar panel for increased reach of its brightness. A day of charging gives 10 hours of light. Phones can be plugged into the USB port on the battery. The phone charger (I learned) is direct charge – i.e., it charges through the battery only while in the sun, not from the battery after sundown. 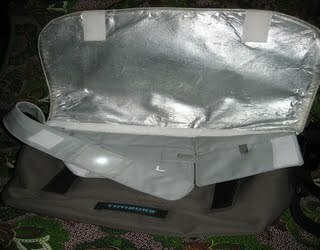 Photo: FLAP bag with reflective side showing. A few weeks ago I wrote about taking the FLAP bag to Mozambique to see what people thought of it. While there I also got a few reactions on video (3 mins long). I charged the panels up a few times in Mozambique and at first had trouble getting the light to turn on. I emailed Portable Light and they explained that you need to keep the button pressed down for a bit for the light to come on. Bingo, it worked fine then. We had a week of steady rain the 3rd week I was in Mozambique and the power was out in my room at the hotel. I was able to use the light for 4 consecutive evenings for a couple of hours and the battery held the power even though I wasn’t recharging the panel during the day. For some reason I wasn’t able to get my i-phone to charge, so need to figure out what’s going on there. I didn’t realize at first that phone charging has to be done via direct sunlight, not stored power, so maybe that is the problem. Will keep trying. I love that the FLAP folks are open to feedback and adjustments to the idea to develop something that’s localized and works for different populations/situations. Most people in the rural communities where I tend to travel don’t own or have access to computers and their phones come with wall plugs, not USB cables. So I think the USB port needs some kind of adaptor. I tested the few USB cables I was able to find, and they only transferred data, not electricity (they didn’t charge up while connected to either a computer or the FLAP battery). This includes the fancy Nokia E63 that I use when I travel. So either I’m missing something (highly possible! ), or the bag needs to come with a cheap universal electricity/USB cable, or if the system is built locally, cables for the most popular phone types could be included or manufactured as an accessory. There are also different ways that people charge locally that could be looked at (though these are probably imported, worth a look? ), for example, the universal charger in the photo above, which I’ve also seen in Senegal. You can connect a camera or phone battery directly. Perhaps an idea to think about. Another option might be something like this universal charger that was announced in October 2009, though it may not be compatible with existing phones that people already own. The cost is currently too high for people at the “Bottom of the Pyramid” (BoP). It probably needs to come down to $5-$10 for the solar panel/battery/light. 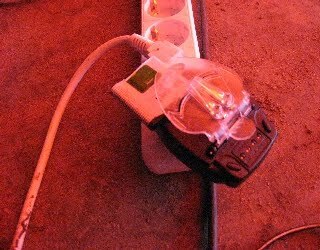 Research on income, similar products (if available), current phone charging costs/costs for candles/other light sources, and perceived value would help to find realistic price point. People don’t normally carry bags where I was, except for backpacks for school, made out of very inexpensive plastic/vinyl. Some ideas that people had on where to put a solar panel included: on school backpacks, curtains, cloths, parasols, clothing, foldable panels that can be taken out and set up at the market or while doing outside work during the day, or something to set in a back window or on top of a car. 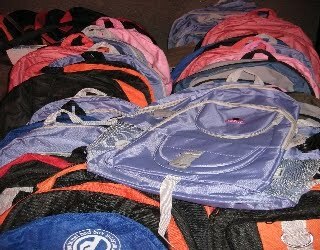 Photo: Common style of school backpacks in Mozambique. ‘Cost per beneficiary’/ROI at NGOs. One person at a large global NGO read my recent blog post and got very excited about the possibility of children having light to study by at night. When I revealed the cost, however, even at $50, the ‘cost per beneficiary’ that many NGOs adhere to due to internal rules or donor expectations was too high. It would be interesting for FLAP to find/do/publish some research on the benefits of light in education, learning, future income, etc., or cost saving in other areas by having solar light. This could be combined with research on economic benefits of mobile phones and the costs for charging locally (eg., in Mozambique this is about 10 MTs/day or USD $0.40) to make the case for FLAP. (Maybe this is already being done). I’m not sure if most NGOs currently include environmental benefits as a main factor when measuring ROI, but these kinds of numbers would be helpful to inform decisions. The bag in its current form at a mid-range price (e.g. $30-45?) could be widely used at the “Middle of the Pyramid.” NGOs already spend on camera batteries, bags, etc. for staff as part of normal operations, and if they were manufactured locally they could generate local business. In the case of Plan (where I work), for example, staff take lots of photos for sponsorship and program operations. Using rechargeable digital camera batteries and FLAP, savings over time could potentially offset the costs, and could be one concrete way to start reducing negative environmental impact. So a good entry point for FLAP could be NGO workers, university students, government workers who spend time in communities and need to keep their phones or digital cameras charged up for mobile data gathering or collecting data, surveys, etc. in ‘the field.’ Another possible link would be with the Peace Corps or other large organizations that equip their volunteers or staff with essential gear before sending them to live/work in rural communities. In order to qualify things, I did a little unscientific research. While everyone at our workshop was together in the same room, I read 6 statements, and asked them to raise their hands if the statement was true. We had around 45 kids in the room, roughly 75% male/25% female, between the ages of 12 and 20, attending secondary school and living in communities within a 1 hour radius (by public transportation) from the school. The school is located along a main road, put in 3 years ago, and the communities/commerce along the road are growing. Also in the room were 10 adult teachers/local NGO partners/folks from national radio stations living in the district. I suppose you would consider the students “poor” by typical global standards, however the fact that they are attending secondary school means that they are not the poorest of the poor. Teacher salaries are around 3,000 MTs/month or about $100. 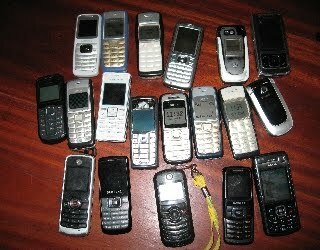 Photo: The phones that were at the workshop. I asked everyone in the room to put their phones on the table (photo above). You can see that the most popular types of phones are the Nokia 1100 or 1200 (which do not come with a USB cable, though I believe they do have a 5-prong USB jack).